If waiting to score a table for dim sum is something you detest, Paradise Fine Dining has you covered. Hidden off of a quiet street behind a bustling plaza, the parking lot was busier than the actual restaurant. Since they offer a special prices before 11am, we thought we should arrive before 10am to avoid a lengthy wait. What a pleasant surprise to find the dining room only half full – you could likely arrive for 10:30 and still meet that special ordering timeline. Particularly for larger tables, the early bird deal of $3.10 for small, medium or large dishes can save you a fair amount given they’re normally S for $3.10, M for $4.50 and L for $5.50. Paradise’s tea charge is higher than most at $1.60 per person, but it’s a small premium for not having to wait. Moreover, they’re friendly, accommodating to families, and the dishes are presented in a well-timed succession so you don’t feel rushed. 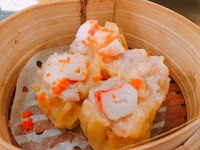 Overall, their dim sum are respectable versions of the dish, but unfortunately nothing stands out. Everything is just a touch under seasoned, so I found we relied heavily on the condiments to add flavour. At least the two most popular dishes are done well: there’s plenty of shrimp within the har gow (L) and the wrapper thin and not overly sticky. If it were steamed just a tad less, the dumpling would be better as the shrimp was starting to reach the point of getting hard. 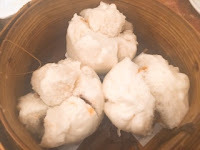 Meanwhile, the sui mai or mince pork and shrimp dumpling (M) were much better – juicy and flavourful comparably. 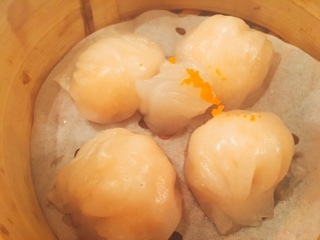 Despite sounding enticing, the steamed kabocha squash and scallop dumplings (L) were tasteless since both ingredients aren’t pronounced. Moreover, the earthiness of the squash doesn’t pair well with the seafood, giving the scallop a mineral-like fish taste. The steamed shredded chicken and baby bok choy dumplings (L) doesn’t resemble the description at all. 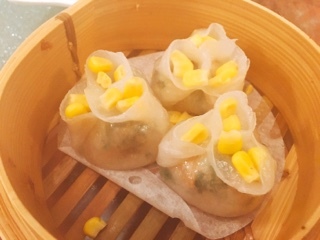 Instead, it’s more adequately described as ground chicken dumplings topped with corn. 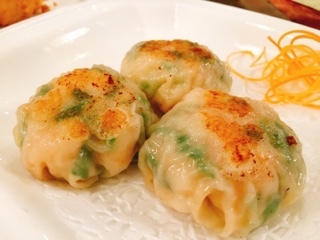 Overall, the dumpling is on the right path, with a bit more salt and another texture incorporated into the filling (crunchy celery or the earthy black mushroom) these would have been delicious. Meanwhile, the chicken was actually shredded in the spring rolls with taro (M); they were hot and crispy, but could use more chicken. If only the grilled dumpling with pork (L) were cooked longer so a crust could develop, these would have been some of the better ones I’ve had at dim sum. 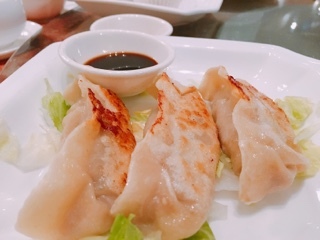 Each dumpling held a fair amount of pork and the wrappers were thin and light. For something similar, I’d opt for the grilled shrimp patties with chive (L) instead. Sometimes these are referred to as "hockey pucks" at other restaurants and Paradise makes really tasty ones. Of all the dishes we sampled at brunch, this was my favourite. The BBQ pork used in their steamed buns (M) and steamed rice crepe (L) had a nice balance of sweetness without becoming syrupy. 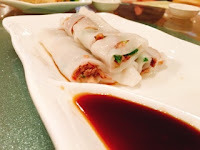 Indeed, the chung fun or steamed rice crepe had the customary silky thinness you’d want with the dish, but the filling needed something else (perhaps finely chopped parsley) for interest. 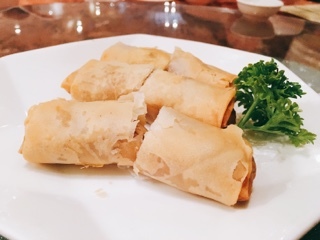 Despite feeling like you’ve eaten tons at dim sum, heed my advice and make sure you order a heavier rice dish … otherwise, you’ll be hungry in a couple of hours. Paradise’s sticky rice with chicken and conpoy wrapped in lotus leaf (M) was a meagre serving with only two small pieces in an order. I could look past the small quantity if they also weren’t so plain - the ground chicken really didn’t have much else added. The second starch we tried wasn’t any better. Admittedly, the deep fried glutinous rice with assorted meat (L) was not what I expected. 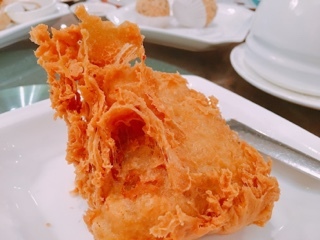 Typically, these jongs are found wrapped in lotus leaf and boiled or steamed; having it battered and deep fried was an interesting twist. The crispy texture mixed with the soft sticky rice was a tasty combination, but the pork with bland yellow beans were rather flavourless so really all you taste is the soy sauce. 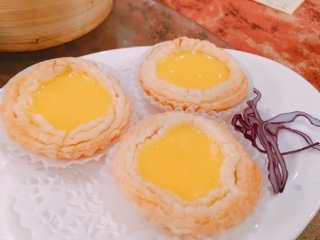 Paradise’s flakey baked egg tarts (M) were predominantly pastry and even then it wasn’t made very well as the tart shells had a powdery finish. 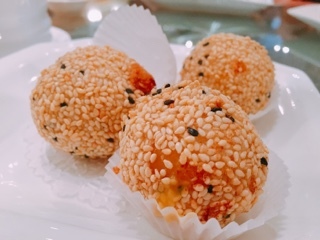 If only I knew the "soft custard centre" in the golden fried sesame balls (L) was actually salty egg yolk based, an ingredient that really needs to be called out as many either love or hate it (in my case hate for desserts), I wouldn’t have ordered the dish. Nonetheless, if you enjoy sweet and salty combinations these would be worth a try. There are a couple of dishes priced too expensively: the steamed rice noodles with shrimp (generally L at other restaurants is XL ($6.50)) and the deep fried octopus (typically XL was considered XXL ($8.50)). 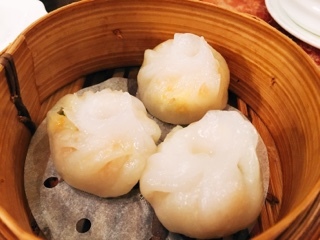 Overall, Paradise has an extensive selection of dim sum with options not generally found elsewhere. Not all are great, as we found out with the kaboucha and scallop dumplings, but at least larger tables can’t complain about not having choices.